Soon after the revelation that the remains of at least 15 individuals had been found in the deep recesses of a cave and that these bones looked as if they had been deposited there purposely, I asked the question: How Will Creationist’s Respond to a Huge New Hominid Fossil Find? The first responses came within the following 48 hours and I wrote about them just a few day later (Bones of Contention II: Ape, Human or Fraud? Young Earth Creationist’s Respond to the Dinaledi Chamber Fossil Discover). The most notable response coming from the young earth creationists’ organization Answers in Genesis who took a very strong stance that the bones were just the remains of an unusual ape: “We seriously doubt the original owners of the Dinaledi bones were among the descendants of Adam and Eve, as the preponderance of the evidence suggests they were animals, one of the variations that developed among apes. So, what sort of creatures do these bones belong to according ICR? These creatures were apes and humans. Yes, you read that right. But they don’t mean they were a mixture of ape and human. Rather they are proposing that the 1500 bones found in the cave are a mixture of apes and humans that were both washed into the cave either at the same time or separately. They are effectively claiming that dozens of top anatomists from around the world have mistakenly assembled a Homo naledi skeleton by mixing bones from multiple individuals that belong to different species: some them fully ape and some fully human. This, in their minds, is why the skeleton of Homo naledi that has been described in National Geographic and the original research articles has portrayed the creature with a mixture of human and ape traits. From the third ICR article in their series published today: The claimed new species appears to be a mosaic of different species put together based on evolutionary biases, not scientific evidence. The scientists built an imaginary creature from bones that likely come from both humans and non-humans. The geology, anatomy, lack of dating, and evidence of recent water action reveal that the media blitz and excitement over Homo naledi is essentially based on a falsehood. It appears the secular scientific community continues their predecessors’ search to find a “missing link” and establish what they have already decided to believe: that our human race came from apes, not Adam. It is possible that flash-flooding of the larger chamber drowned the humans and animals taking refuge in the cave and transported their remains to the back of the cave system. Whether or not the ape-like bones were transported at the same time as the humans is unclear since subsequent flooding may have mixed them around. The bones are not laid out in any organized manner, but are well dispersed. First, notice the suggestion that the bones there are not from a single species but a mixture of two different species. Second, he makes a very natural suggestion that the bones could have been washed into the back of the cave. This might explain the most perplexing observation about these fossils, their very remote location in a highly inaccessible portion of this cave system. But don’t you think that the researchers thought of this possibility already? Of course they did. Much of the original paper on the geological context of this cave system spent time discussion this very possibility. And what did they find? They found no evidence that these bones has been brought there by flowing water. They examined many pieces of evidence none of which supported a flood origin of the bones. There conclusion was no mere speculation and their evidence against water transport must be accounted for. Dr. Clarey makes no mention of their many reasonable tests of this hypothesis. Instead he leaves his readers with the impression that this simple explanation had not been considered. Hand of and adult Homo naledi. Inset image is what is looked like as it lay in the cave. This is not a combined set of bones from two individuals but certainly the bones of one person. Dr. Clarey makes the claim that the bones in the cave are a mixture of bones from two different species. Did he read the original paper? I don’t think he did. The authors address this possibility and say why they don’t believe this is the case. 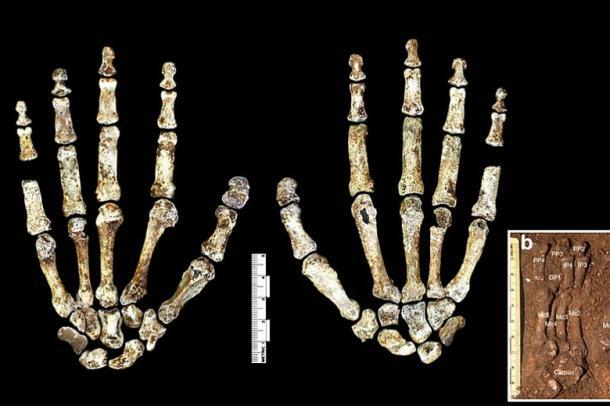 What about the second set of papers that came out two weeks ago about the foot and hand of Homo naledi? Did he consider those? Once again, it seems clear he did not and he does not reference it. An articulated (eg. bones found together not spread around) hand of an adult was found. That hand has some bones described as homo-like and other bones that are more like Australopithecines. To read Clarey’s article one would get the strong impression that the reason some bones are human and some are ape is that these were mixed bones of two species. But this hand was found all together! (see image to right) How much more obvious could it be that we are talking about one species and not two. The bones are found practically stuck together. Dr. Clarey does not inform his readers about these facts. This hand is not imaginary but is very real. Having taken this stance that the bones are a mixture of species and that most of the aspects of this research are tainted by bad science if not fraud, ICR has taken a very different position than that of Answers in Genesis. The latter seem to accept the reality that the bones represent a population of one species. They don’t accept that there were any humans in this cave but rather argue that these bones represent nothing more than a group of unfortunate apes. Clearly these are different interpretations of the evidence that has come to light thus far. In the coming months we are sure to learn much more about these fossils. It will be interesting to see how ICR and AiG respond to this new data and each other. Will they form a consensus about who these bones belonged to, or will YEC continue to be divided on the origin and status of the creatures who ended up in this cave? Dirks et al. 2015. Geological and taphonomic context for the new hominin species Homo naledi from the Dinaledi Chamber, South Africa. eLife 4:e09561. I keep on having to remind myself that this kind of rebuttal of creationism is necessary, since the creationist position is so untenable in so many different ways. People believe (I keep on coming back to this) what they want to believe. How can we change what they want to believe? Here you can do more than me, since you can in all sincerity put forward the view that the science is not in conflict with your religion. It simply boils down to this: When delusion becomes reality, facts become insults. Of course, it is impossible NOT to lie if you are determined to make ALL reality either ‘biblical’ or ‘not unbiblical’. Most Christians I have met do not behave in this fashion. The ICR have either leapt upon this or decided unilaterally that there ‘must’ be more than one species present (which would not disprove evolution). Thus the disgraceful allegations by Clarey today: “The geology, anatomy, lack of dating, and evidence of recent water action reveal that the media blitz and excitement over Homo naledi is essentially based on a falsehood. It appears the secular scientific community continues their predecessors’ search to find a “missing link” and establish what they have already decided to believe: that our human race came from apes, not Adam. AiG have an air of sophistication to them (it unravels on closer examination) but the ICR are just clumsy cowboys and shameless ‘kneejerk’ lying frauds. Imho. This argument is absurd by any measure. So let’s say these Homo naledi specimens (15 so far) are “a mix of human and ape skeletons”. They all have small, ape-like craniums half the size of human skulls. They all have legs and feet closer to human legs and feet in shape. A mix of two species should produce body parts in equal numbers from each species. Do Tim Clarey and the ICR claim that somehow *all* the human skulls and *all* the ape feet went missing? Or do they allege an outright cover-up and deliberate tampering of evidence? yes, it is preposterous. It is difficult to tell if Clarey is just extremely superficial in his thinking about these fossils or is knowingly just creating a smokescreen of confusion. He might not have originally have been thinking cover-up but I am sure if pushed further with the obvious logical questions you raise he will eventually be forced to say that the scientists have intentionally discarded many fossils in favor of this combo-organism. The position of the ICR is unreason posing as common sense. Yeah, the geology is fascinating. I have been intending to write a post about it as part of my “geological context of hominid fossils” series but I’m so jammed for time with my real job this semester that I’ve not been able to write it up. Hopefully during break. When I learned the Rising Star was being called Homo with a claim of “deliberate body disposal,” I thought that the creationists would go for the “obviously human” route. Oh well, it is nice to be wrong since it sets them up for a lot of embarrassment over the next new years. It might be more amusing than the “obviously ape” Homo erectus (sensu lato) becoming “obviously human” in the 1990s. With the Dinaledi Chamber expected to have many times the fossils than what has been recovered so far, the creationists have unusually put themselves a position of being falsified even more clearly than they are now. And with Berger and his team being anything but subtle in hinting that their cavers have found new hominin sites it could really uncomfortable for them if some of the new sites is more Homo naledi. And if one of the new sites is announced to be H. naledi, could they really say the same combination of ape and human bones happened at more than one place? Add to the mix that Ron Clarke has got to nearing publication of Little Foot and we know that Malapa has more materials waiting to be extracted and we can expect that the next few years will be rough on the creationists. Gradually people might start to realize that scientists really do have multiple skeletons — it is not just one “Lucy”. Yes, i couldn’t agree more. I have said I thought the safest position for them to take would be the human one. I’ve been very surprised at where this has gone so far. I have heard the same thing about other fossils in the cave system. You would think they would try to find every scrap of info they could before making their assessment. But Clarey barely seems to have read the first two eLife papers and he probably hasn’t even noticed that there have been two further papers on the hand and foot that were published a few weeks later. I would be very surprised if there are not stone tools in other parts of the cave though I suppose ICR could claim those belonged to the humans that they do acknowledge were there. Yes, a near constant stream of new discoveries and countless publications is nearly guaranteed to come from South Africa over the next two decades. To create such non sensical arguments and feeble rebuttals this guy Clarey, must deep, deep down accept and know that his position is hopeless and wrong, he just continues to write this nonsense to maintain a fading belief that will soon be gone forever. He is doing a public service perhaps to his religious group even as he knows he is talking utter rubbish. Having been raised as a YEC myself, I suspect this is correct. The way in which I was “sheltered” from even the mention of evolution made me realize, on a subconscious level, that there must be some truth to it, or it wouldn’t have to be so rigorously monitored. For comparison, my parents also ensured that I saw very little sexual material in TV or movies growing up. I knew enough to know that this was not because sexuality didn’t exist, but because it did and was inappropriate for one of my age. Looking back, I realize that their treatment of evolution was almost identical. Well according to Answers in genesis humans from Adam and Eve right up to Abraham were were Homo Erectus. Why haven’t the scientists dated any of the bones which would easily clarify whether the bones were from the same time. Hi, unfortunately dating bones is not easy if the bones are old. Usually bone have to be dated relative to other features of the rock they are found in. For example, volcanic ash can be dated by radiometric dating relatively easily and reliably. If there was an ash layer below the bone and one in a layer of rock above they could be dated and the bones would therefore be an age between those two ages. In this case the bones are mostly sitting on the surface. Because of how isolated this part of the cave is, the bones could have been sitting there for 10s of thousands or millions of years and not look much different. We know the bones are very very brittle which suggests they are very old but the lack of radioactive elements in bone aside from possible C14 makes dating the bones directly unlikely since the detection limit of C14 is only about 50,000 years old. If they bones are 50,000, 100,000 or 5 million years old they will look the same to C14 dating so it isn’t terribly useful if the bones are old. It’s even worse than that. Very small amounts of modern bacterial contamination mean that however old bones may be in reality, they may still date, as dinosaur bones often do, in the 30,000 to 60,000 year range. Yes, and this is why doing C14 analysis would is more likely to create confusion than clarity and therefore isn’t usually done on samples that are in all likelihood much older.